Skate with friends and family during Spring Break at the Coolest Place in Town! Team assignments and schedules will be handed out. All games are played at the Owensboro Softball Complex at Jack C. Fisher Park. Community Easter Egg Hunt. Kids of all ages welcome. National Chill Out Day! Kona Ice of Evansville will be handing out FREE Kona Ices from 12 noon till 2:00pm at Smothers Park. Relief from the stress of tax day! "No taxation without relaxation!" Live Stations of the Cross while walking from Sts. Joseph and Paul Parish to Brescia University. Bass tournament with computer generated team draw morning of tournament. 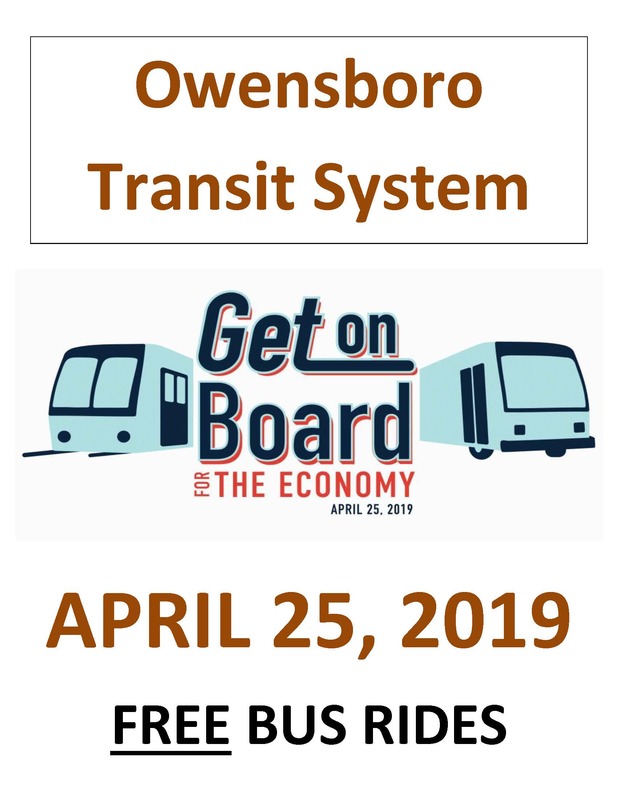 April 23, 2019 - 12:00 P.M.
NOTICE IS HEREBY GIVEN that the Owensboro Board of Commissioners will hold a Special Called Meeting at 12:00 p.m., on Tuesday, April 23, 2019, in the Commission Chambers located on the fourth floor at City Hall, 101 E. 4th Street. The purpose of the Special Called Meeting is to conduct a Budget Presentation for the fiscal year commencing July 1, 2019 and ending June 30, 2020. The full agenda is posted at www.owensboro.org. April 24, 2019 – 4:00 P.M.
NOTICE IS HEREBY GIVEN that the Owensboro Board of Commissioners will hold a joint Special Called Meeting with Daviess County Fiscal Court at 4:00 p.m., on Wednesday, April 24, 2019, in the Courtroom located at Daviess County Courthouse, 212 St. Ann Street, Owensboro, Kentucky. 3) Consider Municipal Order 8-2019 entitled A Municipal Order Authorizing the Sale of the City Of Owensboro’s One-Third (1/3) Portion of Property Containing 30.897 Acres and Located at 3300 Carter Road; and Further Authorizing the Mayor to Execute a Deed Transferring the Property to Riverfront Forward, LLC in Accordance with KRS 82.083(4). The full agenda is posted at www.owensboro.org. 4th Annual American Cancer Society Fishing Tournament open to the community. Competitive soccer tournament for U9 through U19 aged soccer teams. free event open to the public. Donations to March of Dimes are encouraged. Come to Smothers Park dresses as your favorite superhero to celebrate National Superhero Day!